"lufthansa cargo in michigan. we got a redz06 and a regular orangec6. the z06 has some black tarp on the hood and the fenders, i cant tell if its a centr. 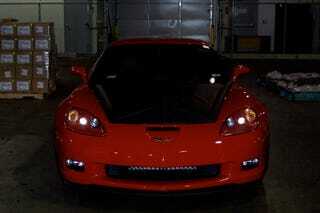 supercharger its to dark outside...ok its gotta be supercharged i just saw a intercooler." Yup, full gallery below — just 'cause we love ya...a lot. UPDATE: The individual who took the photos, an employee of the shipping company EMO TRANS, is now in jail. Here's what we know. Corvette SS Spy Photographer Now In Jail!